Deadbolt door locks. Keypad deadbolts. Electronic deadbolts. Wireless deadbolts. A burglar could smash a nearby window, reach inside and use the turn handle to gain entry to the house. But you still can stop him. Install a wireless door alarm a few inches off the floor. A burglar will not look down but up to spot any door alarms as all web sites are suggesting to install the door alarm up high so young children can't reach it. The burglar will be scared away by the piercing noise as soon as the door is opened. These alarms are inexpensive and retail for around 10 to 15 dollars. I would not recommend installing a double cylinder deadbolt lock. In case of an emergency most people panic and may not be able to find the key to exit the house, even if the key is stored in a prominent place! 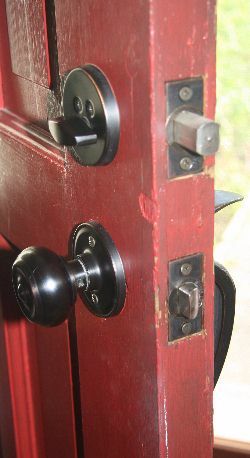 The latch bolt in a common door lock is spring loaded and can be retracted by applying force to the latch. Sometimes all it takes is a credit card to open a locked door! On the other hand, a deadbolt cannot be moved, either way, by force because the locking mechanism is different from the common spring loaded door lock. The deadbolt can not be moved to the open or closed position without a key or turn handle. In a common spring loaded lock the latch bolt, at the very best, extends up to 1/2" (13 mm) into the door jamb and is movable by external force. Compare this with a deadbolt lock where the locking bolt extends at least 1" (25 mm) into the door jamb and can not be moved by external force. Because of these reasons a deadbolt door lock is your best choice of making your home burglar proof. Not all deadbolt locks are created equal, so check out the features offered by different manufactures. Some of the features and models available are keypad deadbolts, electronic deadbolts, wireless deadbolts and key-less deadbolts. Just make sure that the lock is solid and made by a reputable manufacturer. Single or double cylinder deadbolt locks? There are basically two types of deadbolt locks: single cylinder and double cylinder. Bottom lock: Spring loaded latch bolt. Top lock: Single cylinder deadbolt.